Atlanta Real Estate Forum congratulates Atlanta Fine Homes Sotheby’s International Realty for winning a Gold OBIE in the Best Marketing Campaign/Promotion – Developer – Budget over $10,000 category for The Charles. Presented by the Atlanta Sales and Marketing Council, the OBIE Awards are the premier awards given in the Atlanta new home construction industry. Atlanta Fine Homes Sotheby’s International Realty, Developer Services Division began marketing and pre-selling The Charles in December 2016. Just six months later, we successfully reached and exceeded our pre-sale goal of 17 homes sold in June 2017 in order to secure financing and begin construction. 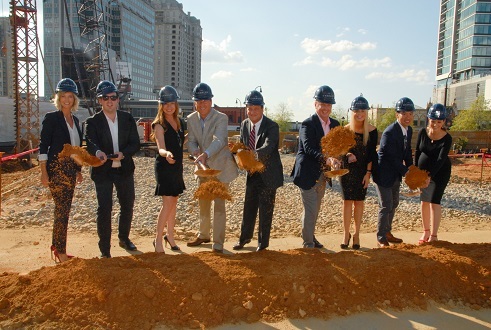 At this time, we were faced with a unique opportunity to not only announce that we would be the first new condominium building to break ground in Buckhead since the recession, but also to capitalize on our sales momentum and the excitement surrounding the success of the project. Almost immediately, in June 2017, we strategically switched our messaging from “Now Selling” to “Now Under Construction” and began to put a strong emphasis on our sales success. Benchmarks such as 30% sold out and “Over $40 million in sales under contract” were also emphasized as these goals were reached. With competing projects unable to reach their pre-sale goals as quickly as we did, we wanted to make sure that the market knew that our progress was real. We launched a link to a webcam with a live feed of our construction site (thecharlesbuckhead.com/#webcam) where potential buyers can check in anytime and watch the building take shape, and we began including this link in e-blasts and digital marketing. Throughout the summer, sales momentum continued and by August 2017, we had sold an additional 4 homes for a total of 21 homes under contract and over $40 million in sales. In order to accommodate our future homeowners whose travel plans in the summer months are typically robust, we decided to wait to host our Groundbreaking Celebration until September 2017. We invited each homeowner under contract and encouraged them to bring their friends and family. We also invited the entire development team including architecture firm, contractors, designers and sales team, along with the media. We held a formal ceremony on the site with a professional photographer who captured the development team using custom shovels to “move the first dirt” followed by a reception at The Loudermilk Companies newly renovated 309 East Paces building. This venue was perfect because it overlooked the construction site and beautifully showcased the stunning views that the future residents at The Charles will have. We had over 150 people in attendance and we wanted to emphasize how important these “founding buyers” were to our success while also beginning to create a sense of community in the building, so we presented them with custom hard hats with their names and The Charles logo on them. The event not only led to several referrals from our “founding buyers” but also attracted media attention. We were written about in the Northside Neighbor, Curbed Atlanta and Modern Luxury. We continued to advertise in the Atlanta Business Chronicle, Atlanta Magazine and other local publications and we reached our sales goal of 50% sold out by the end of the year. This created enough positive sales momentum to raise pricing up to 5% in popular floor plans and continue to sell at a record-breaking rate for new condominiums. In January 2018, we wanted to further expand our digital presence outside of social media and typical digital marketing. We realized how important digital advertising is in bringing in buyers from out-of-state or even investors from other countries. Utilizing extremely targeted demographics and geo-targeting, we launched a four-month campaign that delivered over 2 million impressions and over 6,000 click-throughs to our website. We currently have 34 units under contract for a total of just over $70 million in sales. For more information, visit www.TheCharlesBuckhead.com.